Five hundred years after the old world fell, the Badlands are controlled by six barons. They control the lands between the Rocky Mountains and the Mississippi; nothing is said to lie beyond their borders except wasteland and death. Sunny, the regent (chief soldier) and most trusted servant of Baron Quinn, is convinced that something does exist beyond the Badlands, a safe home for his lover Veil and their unborn son. His discovery of a young boy with strange powers, MK, catalyses his plan to flee the Badlands, just as full-scale war erupts between Quinn and a rival baron, the Widow, who is also searching for the boy. 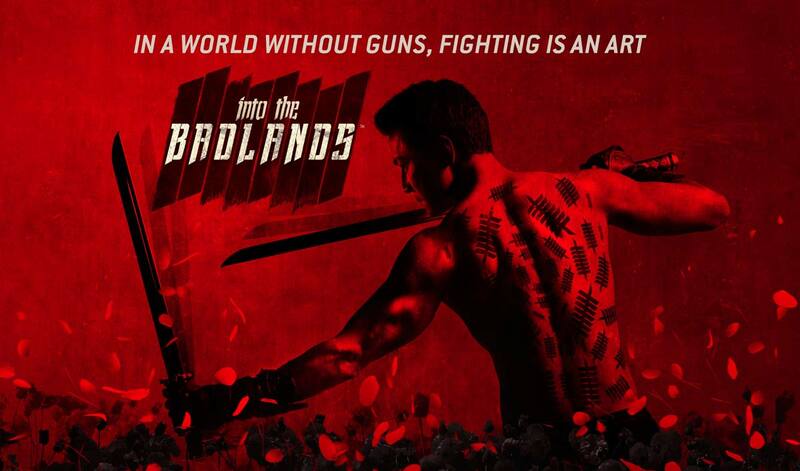 Into the Badlands is an American pulp action series airing on the cable channel AMC, very loosely based on the classic Chinese novel Journey to the West. The series depicts a post-apocalyptic feudal society that has developed after the collapse of modern society, where a few cars and some electricity have survived but guns have not, forcing everyone to use martial arts and swords in combat. The show has a highly contrived premise (to put it mildly) but it doesn't really matter because the show is so much fun. The show succeeds thanks to its cast, who play their parts (mostly) to perfection. Chinese-American actor Daniel Wu was cast as Sunny for both his impressive martial arts skills but also his charisma and brooding presence, occasionally tempered by moments of vulnerability (especially where Veil is concerned) and his tortured loyalty to Baron Quinn (Marton Csokas). Orla Brady brings an impressive amount of class and presence to the role of Lydia, Quinn's older wife who is locked in a battle of wills with his new, younger bride Jade (Sarah Bolger, finally allowed to shine after being criminally underused in The Tudors). Aramis Knight is effective as the mysterious MK, but doesn't have a lot to do apart from looking permanently confused. Madeleine Mantock (The Tomorrow People, the forthcoming Charmed reboot) also impresses in a small role as Veil. Emily Beecham proves to be a great antagonist as the Widow, with Ally Ioannides impressing as Tilda, her teenage protege whose loyalties are also tested as the story proceeds. A weak link is Csokas, who's never been particularly great (his Celeborn in the Lord of the Rings movies was arguably the weakest link in an otherwise exceptional cast) and here veers between high camp and scenery-chewing ham with no layers to be found. The other key element to the show's success is the action. Elaborate fight sequences and impressive stunts abound, with fights that move from clinical, brutal efficiency to epic engagements featuring impressive wirework. More than a touch of Crouching Tiger, Hidden Dragon can be found here. The show's first season also benefits from its low episode count. In just six episodes the show has to set up the world, establish a large cast of characters and let a complex storyline run its course, complete with big action scenes and moments of impressive dramatic action. This focus benefits the season, also the budget does not. Like its network mate, The Walking Dead, Into the Badlands is clearly operating under a very low budget compared to many of the other shows on air at the moment and sometimes struggles to sell larger and more epic moments on screen, relying on pre-existing locations and the impressive stunt team to overcome the clearly limited number of sets. 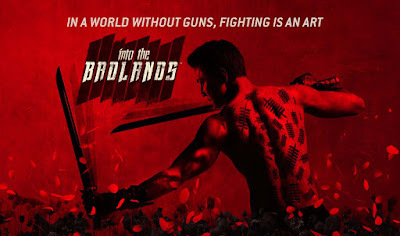 The first season of Into the Badlands (****) is not high art, but it's pulp fun with a mostly great cast and some very impressive fight scenes which overcome questionable worldbuilding and limited production values. The season is available now in the USA (DVD, Blu-Ray). It is also available to watch for Amazon Prime subscribers in the UK. Glad you found this show. Brings me back to the Kung Fu-sploitation movies that used to be on TV on Saturdays. I'm about half-way through the first season, and enjoying it. It's not the best TV I've ever seen, but it's good enough to keep watching. The wu-shu is good, and the setting/background is done well on, as you say, a limited budget. I enjoyed the first season - flawed as it is, it's entertaining. Interesting setting, indeed. The second season recently came to Netflix, and I am finding certain elements are beginning to grate on me. The Widow's ability to effortlessly dispatch armies of men single-handedly is not really that fun. SF&F Questions: Is HARRY POTTER an epic fantasy?